Adenna Phantom Latex Powder Free Gloves are ideal for professionals in a variety of industries. Latex black color stands out and masks stains, inks and dyes and makes it possible to easily identify light-colored substances. 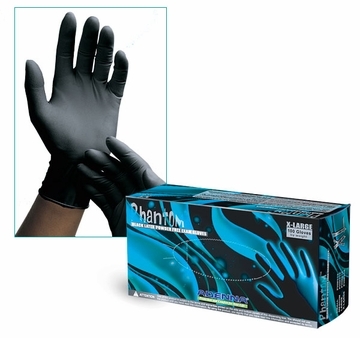 These gloves are powder-free, minimizing the risk of developing latex protein or chemical residue related allergies, and eliminates powder related contamination. Gloves have fully textured surface that provides superior grip in wet or dry applications.